Friedman and Phelps had made a bold prediction in 1968: If policymakers try to take advantage of the Phillips curve by choosing higher inflation to reduce unemployment, they succeed at reducing unemployment only temporarily. This view-that unemployment eventually returns to its natural rate regardless of the rate of inflation-is called the natural-rate hypothesis. A few years after Friedman and Phelps proposed this hypothesis, monetary and fiscal policymakers inadvertently created a natural experiment to test it. Their laboratory was the U.S. economy. Before we see the outcome of this test, however, let’s look at the data that Friedman and Phelps when they made their prediction in 1968. Figure 6 shows the unemployment and inflation rates for the period from 1961 to 1968. These data trace out an almost perfect Phillips curve. As inflation rose these eight years, unemployment fell. The economic data from this era seemed to confirm that policymakers faced a trade-off between inflation and unemployment. This figure uses annual data from 1961 to 1968 on the unemployment rate and on the inflation rate (as measured by the GDP defoliator) to show the negative relationship between inflation and unemployment. The apparent success of the Phillips curve in the 1960s made the prediction of Friedman and Phelps all the bolder. In 1958, Phillips had suggested a negative association between inflation and unemployment. In 1960, Samuelson and Solow had shown it existed in U.S. data. Another decade of data had confirmed the relationship. 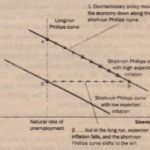 To some economists at the time, it seemed ridiculous to claim that the historically reliable Phillips curve would start shifting once policymakers tried to take advantage of it. In fact, that is exactly what happened. 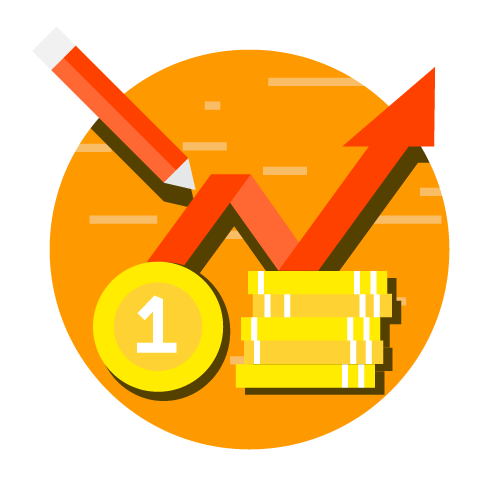 Beginning in the late 1960s, the government followed policies that expanded the aggregate demand for goods and services. In part, this expansion was due to fiscal policy: Government spending rose as the Vietnam War heated up. In part, it was due to monetary policy: Because the Fed was trying to hold down interest rates in the face of expansionary fiscal policy, the money supply (as measured by M2) rose about 13 percent per year during the period from JQ 0 to 1972, compared to 7 percent per year in the early 196Os.As a result, inflation stayed high (about 5 to 6 percent per year in the late 1960s and early 1970s, compared to about 1 to 2 percent per year in the early 19605). But as Friedman and Phelps had predicted, unemployment did not stay low. 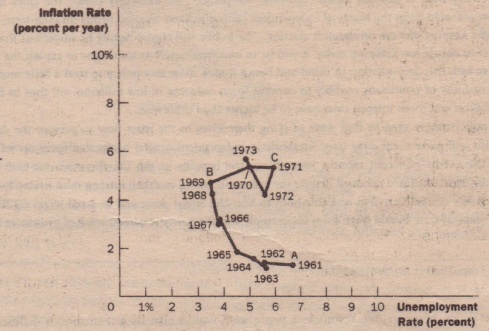 Figure 7 displays the history of inflation and unemployment from 1961 to 1973. It shows that the simple negative relationship between these two variables started to break down around 1970. In particular,as inflation remained high in the early 19 Os, people’s expectations of inflation caught up with reality, and the unemployment rate reverted to the 5 percent to 6 percent range that had prevailed in the early 1960s. 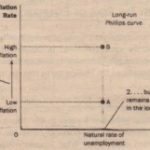 Notice that the history illustrated in Figure 7 resembles the theory of a shifting short-run Phillips curve shown in Figure 5. By 1973, policymakers had learned that Friedman and Phelps were right: There is no trade-off between inflation and unemployment in the long run. 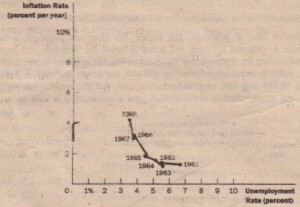 This figure shows annual data from 1961 to 1973 on the unemployment rate and on the inflation rate (as measured by the GDP deflector). 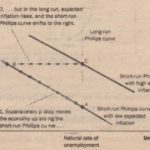 The Phillips curve of the 60s breaks down in the early 1970s, just as Friedman and Phelps had predicted. Notice that the points labeled A, B, and C in this figure correspond.